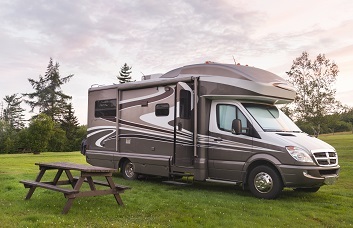 The Class C Motorhome is considered the practical RV. It offers many of the same items as it's counterpart, the Class A, but it's focus remains on easy travel, not glamourous living. Built with van-based cabin chassis, you can spot a Class C simply by it's roof style sleeping loft. Class C’s can range in length from 23 to 38 feet with a standard width of 8.5 feet and a height of approximately 7 feet inside the living space. Popular models include Ford, Dodge, Chevy and in recent years, Mercedes. Most C's offer full entertainment systems, generators and sometimes even solar options. Easy Warranty Work on Cab - Owning a Class C means no matter where you find yourself, someone should be able to work on your engine. Class C campervans offer an engine that is easy to access and familiar at nearly every garage. Easy To Drive- Class C's are less intimidating to drive than their bigger counterpart, the Class A. The Class C offers a familiarity inside the cab that makes many drivers feel instantly comfortable. Better Gas Mileage- Class C's average a solid 12 miles per gallon with a gas powered engine. If you are hoping to save on fuel prices, the Class C will cost less at the pump than most Class A RV's. Lots of Sleep Space- It's easy to find sleeping space for both tall and small occupants inside the Class C. It's furniture is designed for quick conversion from instant beds, then back to furniture in mere minutes. Easy To Heat & Cool- With it's smaller windshield and the ability to divide the cabin from the coach by a curtain, the Class C Campervan can be more efficient to heat and cool than a Class A .
Safer- The RV Consumer group rates the Class C as safer than a Class A due to the cockpit construction and it's numerous airbag systems.